The case is well known, that well known in fact that one only needs to look up Wikipedia or go through a standard MBA curriculum to see I am not giving you news. It’s general knowledge. It is the story of the victory of cunning improvisation over adherence to plan. While researchers, using the case as a Rohrschach to project into it what they want d it is a huge success story of flexibility and serendipity allowing for innovation and enforcing the luck of the brave and bold. After the war, the Japanese market was ablaze with small motorcycles. 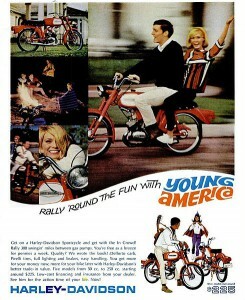 One of the huge hits was the Honda Super Cub. Honda was a dominant player on this market. And so Honda learnt very well how to produce such models with small capacity with great quality and which markets to reach out to. In the USA at the same time, motorcycles and especially Harley-Davidsons where selling big time, even though with different models and image than one might assume today. Directly following Harley Davidson were British companies, selling around 50% of the bikes in the US. Japanese producers did not matter. 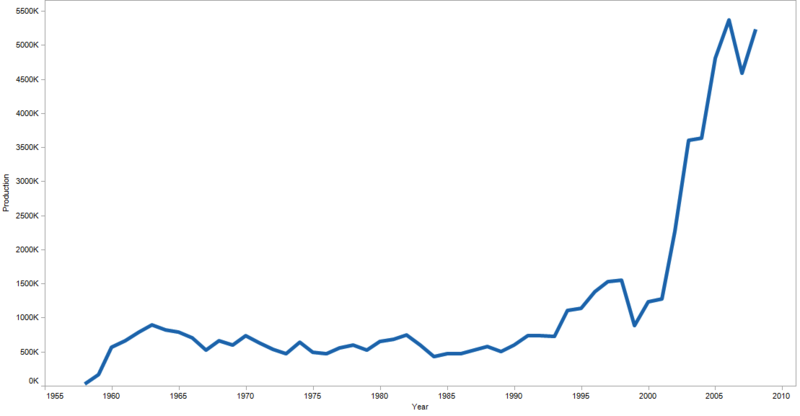 Japanese world export of motorcycles was less than 4% of the Japanese production. Growing sales in Japan after the war inspired Honda, much more so growing sales in the US. Less inspiring was the own share in these sales numbers. So Honda tried to enter that market. 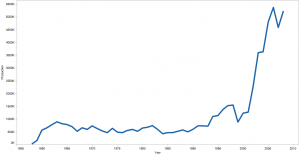 They researched the market intensely and tried to come up with models matching the market – or rather the understanding they had from the market. The consequence was big bore machines. But this strategy brought no success. Sales were way below expectations. And another problem came up additionally. Not used to building big bore machines, technical problems came up. The engines heated up and seized. Honda then decided to send all affected machines back to Japan. While it was horrible to have to send back all machines to Japan, the way of uncompromised quality was rewarded by the sales partners. This was important for a new kid on the block, such as Honda, that just won its first sales partners. Now an additional effect set in: While the heavy machines didn’t attract American buyers, the small ones that the sales guys were using to visit the sales partners, drew the attention of these and clients to them. This was the Honda Super Cub, later the American Honda 50. And now a tipping point was reached and one thing led to another. Instead of serving the market like intended, Honda turned bad into good and revised its plans completely. Now they started selling the Honda 50 instead of the big machines, which they were used to produce in high quality and sell in large quantities at home. Of course, they could not oust the larger machines. 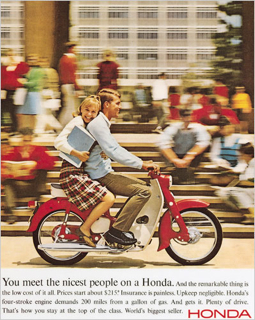 Instead, Honda came up with the marketing towards citizens and claimed that ‘you meet the nicest people on a Honda’. This made sense, as the image of the big bores already was coined by the rough guys. But there’s space for both sectors. Marketing was driven by the then well known agency Grey Advertising. And this turned the image of a complete industry, amplified by the uber clean appeareanc eof Honda sales partners, completely in suits, shirts and tie. In Words: The yearly production of the Honda 50 for the US grew from zero to 900.000 in the five years from 1958 to 1963. Hiding behind ‚wonderful staff’, „people who can make the organization work“ and „decision to build its own sales network“ is: A learning organization, reading the and responding to the market and going for bold decisions, abandoning an existing plan when necessary to follow the goals in other, unusual, unforeseen ways. The possibility of all this in a huge enterprise may encourage one or the other depressed soul, currently being choked in much smaller companies. Without boldness and a lack of any knowledge of the customer. Disruption needs space to breathe and the option to learn by serendipity, needs to enforce the luck of the bold mover and so enforce and then catch the upside options. The main ingredient for this is a culture of learning, empowered by multiple safe to fail experiments and the dedication for radical, unusual decision coupled with patience and the oversight to be in the game in the long term rather than chasing the random short term over night success. It is not without irony that the ‘stay in the plan’ researchers from BCH read the story completely different as only they can read it. The thought this turnout was the result of perfect upfront planning to conquer that niche. In fact it is the perfect example of improvised thinking rather than scripted thinking. It demonstrates the power of serendipity, boldness flexibility and a learning organization. Honda itself knows what and how it accomplished this market entry and why. You can read about it here. Nowadays, Eric Ries would call this a perfect example of knowledge accounting. The whole story is a little unintuitive, as Honda did actually not adjust its product to the US market. Rather they had the chance to simply draw an existing option which had better market fit, but for a new submarket in that market that they actually created by chance. They just had to change the product a little and adjust marketing to the American culture to achieve the breakthrough. Smart dreams about this to the current days and sits in its niche – uninspired. I got aware of the story for the first time while reading the great book on team collaboration ‚Group Genius’ by Keith Sawyer. He tells the story to highlight the power of improvised thinking over script thinking – aka sticking to the plan. We will review the book in detail in one of the next blogs. In short: BCG completely missed the point: Honda was successful because they left the plan. Had they stuck to the plan, they would have lost the option. Givng up the old plan meant success. Lets remember this.